Nucor Corporation is surviving the long steel industry downturn because of this unique business feature. Nucor Corporation (NYSE:NUE) is one of the United States' largest steel companies. Steel has been a tough business since the 2007 to 2009 recession, facing falling prices amid intense competition domestically and from foreign imports. But Nucor has managed to hold up really well, relatively speaking -- partly because of its unique cost structure. Here's why. Nucor lost money in 2009, the tail end of the last recession. So did competitors Steel Dynamics (NASDAQ:STLD), United States Steel (NYSE:X), and AK Steel (NYSE:AKS). Only global steel giant ArcelorMittal (NYSE:MT) was able to turn a profit that year. But that's when things started to change in a big way. AK Steel has bled red ink each year since 2009. U.S. Steel has only been in the black once. ArcelorMittal's bottom line fell into the red in 2012 and hasn't gotten out yet. And Steel Dynamics, after a string of profitable years, dipped back below the break-even line in 2015. But for Nucor, 2009 was the last time it was in the red. To be fair to all the companies involved here, steel has been a rough business. A generally slow global economy has limited demand while key suppliers around the world, mostly China, ramped up steel production. That's led to a global oversupply that has kept pricing weak and made competition increasingly intense. But how has Nucor managed to keep its head above water while so many of its peers have been struggling? When everything is going well in an industry, companies and investors sometimes forget that costs matter. But not Nucor -- it runs a lean machine. That's reflected in the fact that its business is built on electric arc furnaces, which are more flexible than older blast furnace technology. And it uses a lot of scrap steel, which tends to be cost effective, overall. But that's not the only differentiating factor -- Nucor isn't the only company that uses scrap or electric arc furnaces. One of the big differentiations right now is Nucor's ability to keep its sales, general, and administrative expenses (SG&A) in check. In 2015, SG&A was roughly 2.8% of Nucor's sales. The closest competitor was U.S. Steel, where SG&A was roughly 3.6% of sales. That's a big gap and a real competitive edge for Nucor in what was a very difficult year. Data source: Company earnings reports. This data leads to the inevitable question: How did Nucor keep its costs so low? Since the steel industry has seen a raft of mill closings and layoffs, you might think that's what has been going on at Nucor... but that's just not the case. In fact, Nucor's employee count of 27,300 in 2015 was 25% higher than its count in 2009, when it lost money. The real key is the steel mill's unique variable compensation structure. All employees have a significant part of their compensation based on their productivity. Production employees work under group incentives that provide increased earnings for increased production. This additional compensation is paid weekly. In other words, if Nucor is doing well, its employees share in that success. But when things go the other way, the production-based pay goes away, and employees share in the hard times. NUE SG&A Expense (Quarterly) data by YCharts. Since the payments are handled weekly, Nucor's employee costs change quickly. To illustrate how big a deal this can be, in the fourth quarter of 2015 the company's SG&A expenses (it calls these costs marketing, administrative, and other expenses) fell 28%, year over year. For all of last year they dropped about 12%. 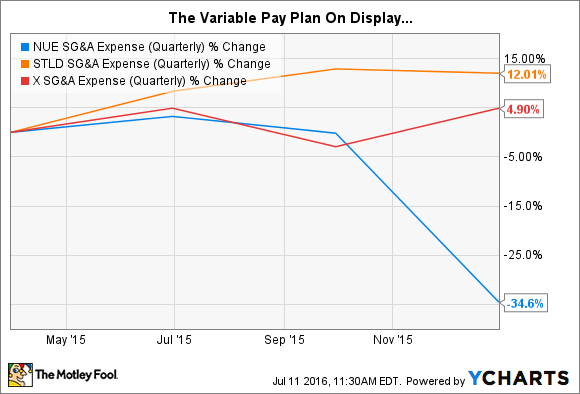 The main driver of this trend is the variable component in what CFO Jim Frias calls "a pay for performance company." The company posted a loss in the fourth quarter of 2015, leading to the steep quarterly SG&A decline, but a profit for the full year. Durable competitive advantages come in all different forms. One of the advantages that sets Nucor apart from its peers is its ability to adjust its costs as performance waxes and wanes. In good times, it won't look very different from its peers on the SG&A side of things. But in bad times, when it most needs an edge, its variable pay structure shows up loud and clear. If you are looking at the down-and-out steel industry, Nucor's compensation plan is a big reason behind this mill's ability to stand apart from the pack.